Anyone with an active role within the website of ECOOP 2016 (e.g. authors, committee members) can start a blog. Want to write a blog but don't have an active role on the website yet? Please ask one of the organizers to request post privileges. Note that you need to be logged in, in order to post a blog. ECOOP was a great experience. Thank you organizers for hiring so many volunteers! Hi, I am Andre Kuhlenschmidt and I am a second year Ph.d. student under Jeremy Siek at Indiana University. I am currently working on implementation techniques for sound gradually typed programming languages. The European Conference on Object Oriented Programming is dedicated to the study of object-oriented technologies broadly construed. 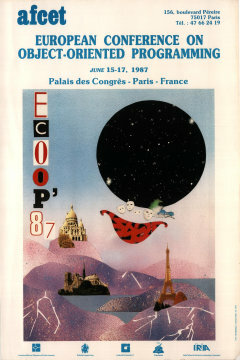 ECOOP turns 30 this year.